How do I, a small boy from rural Ontario, write a love story because this is ultimately a love story? And how about a love story with three main players involved? But it is a great story and deserves to be told. I first met the Oblinski’s a few years ago, of course, at a car event. Right away everyone recognizes how well they complement one another. Ruth is bubbly with an infectious laugh that soon has everyone smiling. She knits and sews but her major interests are quilting and, well, Terry. The quilts she makes are beautiful and remind me of the quilts my grandmother and her sisters made. Ruth also bakes the best butter tarts. I am not to have such sweet treats, but I am pretty sure that well, perhaps, I may have at one time or more sampled them a little, well maybe a lot. Fabulous tarts! Terry is the quiet reserved guy who is easily described as a Man’s Man. Athletic, strong, handy – whatever is broken and needs to be fixed or needs a part to be made so it can be fixed, he can do it or figure out how to do it. His devotion to Ruth is readily evident to all. Both are so willing to help anyone. Great people to have in our community. Over several brief car-oriented encounters, we got to talking about cars and how we had progressed on our life journey. I quickly realized there was a great story here. So, a few years ago, these two young people, Terry and Ruth, grew up in the same area of St. Catharines and went to the same high school. All through that high school they dated, and all their friends were sure that, eventually, they would get married. Terry had a newly minted driver’s license and was always on the lookout for a new, to him, vehicle. The wealth of car knowledge he demonstrates started young as he worked in his Dad’s scrapyard. In 1964, Terry visited another scrap dealer, down by the Welland Canal, in St. Catharines. This yard was about 10 acres and he remembers, that day, there was a crane at the back of the yard pulling out cars to be burnt and scrapped. He even remembers the rows of cars, 1946 to 1948 Chev’s in a neat row. Same neat and orderly rows for other years of North America’s best brands. Even Plymouth had a row. Terry remembers thinking these were good cars, pretty nice and many were drivable, but people had just gotten tired of them and given up. In his tour around the yard, he spotted a 1937 Plymouth businessman’s coupe. It sat up on a pile of tires. But it had only three tires and wheels of its own and no carburetor. But to Terry it looked pretty good. He was definitely interested. So, after the tour, he went back home to discuss it with Dad. Dad did some checking and found the car could be bought for $60. For that price, Dad even got a fourth tire and wheel. Now all that was needed was $60. Terry was at the time, working for Dad in the scrapyard. After 1½ weeks he had $60 and was the proud owner of a 1937 Plymouth businessman’s coupe in addition to his very tired and very done 1952 Pontiac. Insurance for the cars was then $25 per year for the Plymouth and $100 per year for the Pontiac. The discount was applied as he could only drive one at a time. 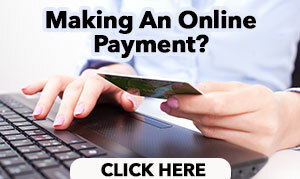 We would all like to pay that now. Soon, Terry got to looking at a brand-new carburetor he already had for the Pontiac and decided it would fit the Plymouth. The carburetor did fit and with some of Dad’s lawnmower gas, he was driving the Plymouth. Ruth and Terry had one of their first real dates in this car and all through high school it was their means of transportation. Cool was brought to a new high when Terry took the hood off to drive around. The Plymouth was relatively trouble-free driving. Well, except when the left rear wheel passed the car as they were driving, down the road, to Ruth’s family cottage. These vehicles did not have studs holding the wheels on but rather bolts that went through the wheels into the drums. Terry found enough bolts on the ground, jacked up the car and reinstalled the wheel and bolts. Off they went to the cottage. Later Terry repaired the rear fender that was damaged in the last wheel event, and with some paint all was good. Terry and Ruth went off to post-secondary school. Terry to University of Guelph and Ruth to McMaster University. They went their own ways as life sometimes take us. Ruth said she waited 10 years for him and at year 12 she gave up and continued her own life. In 1968, while at University, Terry sold the car to some kid and used the money to help with education costs. After finishing school he moved to eastern Ontario, using his degree as a Program Director at the YMCA in Cornwall. He determined that this position was not his true calling and he started his own business making pallets. He unexpectedly had a great opportunity to sell this business and did so. Recognizing he had a flair for manufacturing, as witness the pallet factory success, he applied for and was rewarded with a position at the new 3M plant in Perth. He worked there for the next 29½ years until his retirement. While on her own life journey, and 35 years later, Ruth encountered Terry’s mother while out shopping. Ruth mentioned the laugh they had when the wheel came off the old coupe. Terry’s Mom called Terry and relayed the story of running into Ruth. Communication lines were opened, when Terry then sent Ruth a family video and a letter. So, Ruth emailed him and in the course of the email asked about his status – as it is now called. Ever the almost poetic but quite romantic, Terry replied, “I don’t wear a wedding ring and I won’t wear one until I put one on your finger.” The romance still burned brightly. Meanwhile, the coupe kept circulating into their lives as Terry’s sister married a lifelong drag racer who would periodically see the 1937 Plymouth in Niagara. He would always inquire if it was for sale and then report back to Terry. Then in 1996, Terry’s Mom and Dad sold their rural property and moved to an apartment in St. Catharines. Dad looked out the apartment window into the building’s parking lot and knew he knew that car, the 1937 coupe. Still not for sale though. In the intervening years Terry built a 1936 Ford 2 door, a 1947 Ford ½ ton and a 1946 Ford 3 ton that was the Perth Lions Club parade vehicle. But the Plymouth coupe was always in the back of his mind. By 2004, Ruth and Terry were re-united and living in the Perth area. In 2009, the owner of the coupe decided to sell it. His health was bad, and he had given the car to his son who, “could not do anything” with it. The car had not been running for six years and had been sitting outside. Just a couple of days before Easter 2009, the son confirmed he was willing to sell it for $3,000. Ruth’s only question was, “What are you waiting for?” She knew it was important to both of them. As Terry and Ruth had planned on going to St. Catharines for Easter, they simply changed vehicles, hooked the truck up to the car hauler and off they went. So, in 2009 they were all united and all that had to happen, to make it perfect, was Terry had to get the old coupe on the road. It was a three-year total frame off rebuild by Terry. He did the vast majority of the work in his shop at home. The bottom 16 inches of the car had to be replaced. He got it off the frame by building a steel frame inside the car to keep everything straight. The actual frame was really good despite being outside for so long and just required blasting and painting. So, by starting at one corner and working his way around the car, he gradually finished the body. This job was greatly sped up by being able to buy corners and running boards from a guy, in Delaware, who was making these pieces by hand. Some parts were acquired at various wrecking yards and swap meets. Terry made rocker panels, the driveline tunnel, floors and a new firewall plus many other pieces as the body was gradually restored. Still a huge amount of bodywork was required to get the dream car back on the road. When the body was done, Terry cut out his temporary internal frame used to keep it straight and let that frame just fall. Then he installed the body onto the real frame. It is noteworthy that the left rear fender, repaired by Terry in the 1960’s, was still on the car but Terry improved on these repairs as part of the restoration. When Terry’s Dad saw the car out the apartment window it was white and gray. When Terry and Ruth bought it in 2009, it was salmon and white. When the paint was sandblasted off, during the restoration. there were nine layers of paint on the car. Amazing. The reacquired car had a seized 318 in it and a 727 Mopar transmission. Terry managed to trade the seized 318 for a Mopar 360 at a wrecking yard. This motor was rebuilt by Terry. The transmission was rebuilt by Milton Dennie of Perth. A Ford 9” was installed. A Mustang II front end was installed with coil-overs out back. Now what colour to paint it? Terry had just received his Summit Racing magazine with its car oriented centre-fold – a Ford with the top part painted champagne and the bottom painted root beer. Ruth saw it, the decision was made when she commented, “That is the one!” Just to change it up a little, they put the champagne on the bottom and the root beer on the top. Perfection was completed in 2012. All three were united in a drive that can easily be described as, “an enjoyable and romantic tour down memory lane.” It is a beautiful car and well received at all the local shows. Truly a testament to Terry’s abilities. Imagine driving down the road today in the same car you dated in, in 1964! 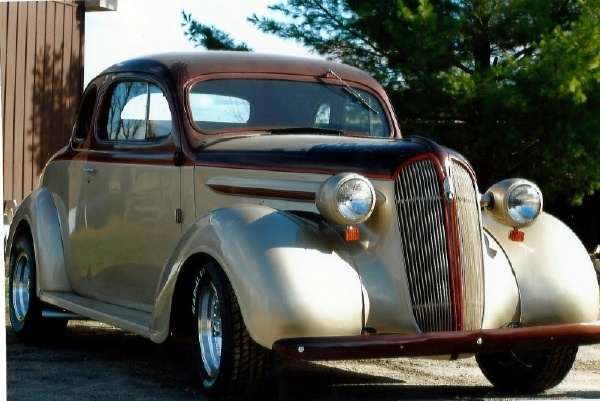 Terry is currently working on a 1947 Ford panel truck that is also going to be amazing but does not have the same love connection as the 1937 Plymouth business coupe hot rod. He recently completed and sold a great 1931 Ford Model A hot rod. To describe Terry’s abilities as talented, is an understatement. Special thanks to Terry and Ruth for sharing this story. Always fabulous to see the two lovebirds in their pride and joy. We close this story with a quote Roy Rogers, “Happy trails to you,” Terry and Ruth.